We're interviewing Abby Jaramillo. She's the executive director of Urban Sprouts School Gardens, a super-green organization that helps kids plant gardens in the city. We were inspired to start our site by the movie An Inconvenient Truth. What was your inspiration? When I was a kid I was lucky enough to have a grandma who lived in the country. I visited her in the summers and learned about nature. I loved that so much. I realized that a lot of kids who live here in San Francisco, in the city, have never hiked in the woods, have never touched dirt or worms, and have never eaten an apple right off a tree. 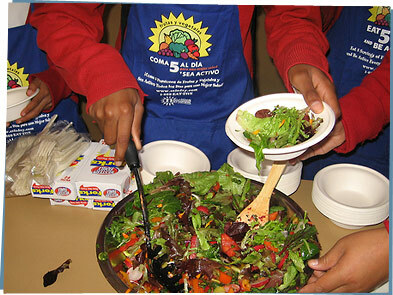 Also, the kids noticed that in our neighborhoods, you can buy candy, soda and fast food on every street but there is hardly anywhere to buy fresh and healthy fruits and vegetables. So we decided to build a garden at school. What do you think kids can learn from a garden? We know that kids who learn in gardens do better in school, like school more, eat more fruits and vegetables, do more to take care of the environment, and feel better about themselves because of the self-confidence and happiness you get from gardening. We're part of a research study (like a big experiment!) that showed all these things can really happen. For kids that want to try gardening but don't have this kind of program at their school, or even a backyard, what can they grow and how can they get started? Gardening is really experimenting, just like science, so find some soil, seeds, and water and give it a try. Fava beans, beets, carrots, broccoli, and cooking greens like kale or chard are the easiest to grow. The most important ingredient is compost, which you can make yourself. 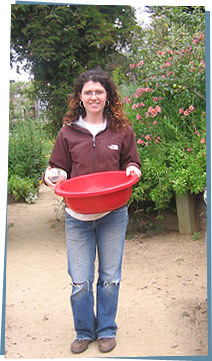 The best way is to make your own worm bin and use worms to turn your garbage into compost, called vermicomposting. There are lots of websites about it and most plant nurseries are very helpful. Also, our website and blog describes all the things we do in the garden and has a list of resources for starting a school garden. Our favorite book is called The Growing Classroom, by Life Lab Science Program. A book we read for inspiration is called The Gardener, by Sarah Stewart. Are your school gardens organic? Yes, all our school gardens are completely organic. Organic gardening means you don't use any chemicals like bug killers, weed killers, or fertilizers made in factories. Those chemicals can make you sick. Our gardens don't need any of that, because we let nature do all the work for us. For example, worms eat our food scraps and turn them into compost, which is the best fertilizer of all. We don't need to kill bugs because we have spiders, ladybugs, and birds that eat the bugs for us. Our gardens attract these helpful animals because we plant flowers and shrubs that grow in nature here in California, providing habitat, or a place for animals to live. Organic gardening is about making a healthy, natural environment where plants and people can grow strong together. Thanks so much, Abby! You're an inspiration!